Debra, These pears are fantastic! They look so juicy and life-like that I feel I could just pick on up off the screen. The texture and sheen of the skin is perfect. I am impressed with your other EDiM sketches too--you have been busy! Debra, it's amazes me how you achieve these results. Beautiful work. These pears are fantastic... they look incredibly real ! 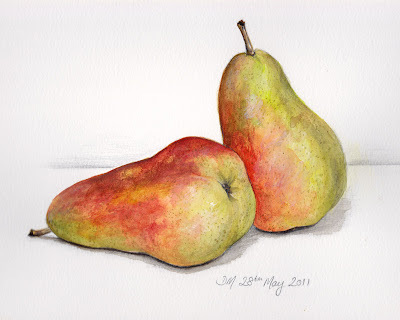 I love the detailed texture of the pears. Did you splatter them with brush (paint or tooth?) or paint each freckle individually? Wonderful!